It was exactly a week ago that I saw Haider, a film by Vishal Bhardwaj, who has made a name for himself, particularly for his adaptations of Shakespeare's dramas. His earlier films, Maqbool (an adaptation of Macbeth) and Omkara (an adaptation of Othello) are considered two of the most captivating dramas to come out of mainstream Hindi cinema in the recent years. Haider is his third adaptation of Shakespearean drama. This time he chose Hamlet, the most well-known tragedy in English literature. Vishal Bhardwaj has managed to present, for the most part, a good adaptation of this powerful story using an interesting and engaging narration. The lead actors in the film have performed their parts very well, making the experience of movie watching quite enjoyable. But what puzzles me (and perhaps many other people too, if I go by some of the comments and discussions going on in social media and also on the basis of a few reviews of the film) is the choice of political context in which the story of Haider has been situated. Allow me to present a list of seven points which made me wonder whether this time around the filmmaker's love for Shakespeare has taken a backseat to his politics in this third adaptation of the bard's plays. 1. The film Haider ends up presenting a rather black and white portrayal of a selected issue of Kashmir problem. The Army with its Special Powers Act is shown as the perpetrator of horrendous wrongs, and the separatists/terrorists/sympathisers of terrorists are shown as the victims of these horrendous wrongs perpetrated by the Armed Forces. While we can't deny that some horrific abuse of power always takes place when military is deployed anywhere in the world to curb terrorism or such serious crimes against humanity, can we ignore the fact that it was the extremely horrifying nature of crimes committed by the other side which led to the deployment of military in the first place? Who is the perpetrator here? Who is the victim? These are not black and white questions. And yet they are, in a way. It depends on the political lens through which one chooses to view and understand the reality. A more nuanced and subtle intellect would try to see the various shades of gray in complex problems like that of Kashmir, a problem that has been in making since Indian independence, and not jump to immediate and politically biased conclusions based on quick and cursory readings. A political leader's job is different. He or she has to make some strategic decisions (deployment of army to curb separatist or terrorist activities in a state is one such decision) and therefore must have the necessary clarity of mind to distinguish fact from perception and must have the will to follow a reasoned approach to address the problem. An artist, a film-maker, on the other hand, works with the more subtle realms of perception, interpretation and expression. Can a film that is definitely trying to portray a highly sensitive political issue of the day ignore the grays of the situation and get away with only a black and white portrayal? I don't know the answer to this question, but I feel compelled to ask this question after watching Haider. 2. Unlike Shakespeare's Hamlet, the character of Haider in the film doesn't seem to face much of a conflict when he is presented with two versions of the story of his father's killing - one by the character of Roohdar (Rooh, an adaptation of Hamlet's father's ghost from the original play) who tells him of Haider's uncle's role in the killing of his father, and the other by his uncle, his father's brother who tells Haider of Rooh's real identity and role in Hamlet's father's killing. Haider's confusion regarding who to believe lasts just for a little while, and the way the story is being told it comes as no surprise when Haider chooses to believe Rooh. While in the original play we find Hamlet somewhat obsessed with the idea of "proving" his uncle's guilt, in Haider we somehow find this young Kashmiri student almost convinced that his uncle has in fact committed the crime. In Haider however, this is not merely a personal crime, that of killing the king, Hamlet's father, as in the original play, but a more political crime, that of being a spy for the Indian army. This overt politicization of a serious human tragedy seems to suit well the film-maker's agenda or politics. That agenda, I suspect, is to portray a suspected terrorist or a suspected sympathiser of the terrorists (i.e., Haider's father) as an innocent victim of the brutalities unleashed under the AFSPA (Armed Forces Special Powers Act). Unlike the original Hamlet, whose inner struggle is what makes that character so timeless, Haider in the film seems much convinced of who is in the wrong here. This is one of the ways in which the film Haider becomes a bit more politically charged and favouring a certain political view. 3. The film's narrative starts from 1995. There is hardly any mention (except for one weakly and meekly mouthed line by an army officer, which can be so easily missed in the noisy scene) of the brutalities and horrors that were unleashed by the separatists and terrorists in the Kashmir valley, especially on Hindu and Sikh population who were tortured, killed or forced to abandon their homes and businesses and become refugees in their own country from late 80's to early 90's. This feels like an attempt on the part of the film-makers to project a certain side of the truth as more relevant or more integral to the larger story of Kashmir problem. An un-informed viewer may even come out believing that the entire horrifying story of Kashmir problem was perhaps a result of the brutalities of Indian Army. It is true that no story or film can present all possible sides of the truth or reality, but such open attempt to highlight only one side while rejecting all the other possible sides seems highly suspect, especially when the film is about a very sensitive subject. 4. The timing of the release of Haider is also a bit tricky. While generally the film-makers may not have much control on this aspect of the film, it is not uncommon however to hear that release dates of some big films have been changed due to various reasons. (Usually these reasons have to do with avoiding competition of films of big stars). The film came out when huge sections of Kashmiris were still facing the brunt of the recent disastrous floods in the state. The film came out when most Indians hadn't fully gauged the terrible destruction and devastation faced by their fellow Indians in Kashmir. The film came out when most Indians were still singing praises of the exceptionally valiant work done by countless soldiers of Indian Army in saving thousands of civilian lives and all other rescue and relief efforts. To be fair to the film-makers, it must be mentioned that just before the end credits of the film start rolling, a statement comes on the screen paying a tribute to the efforts of Indian Army in saving thousand of lives in the recent floods. But let's be honest. How many viewers pay attention to such statements at the end of the film? How many even linger in the theater till the end-credits? As soon as the last scene is gone, people are busy gathering their belongings and kids and exiting the theater to get to the parking lots. Wouldn't an opening statement have been a better choice? Not just about the army's efforts in the recent floods but also a few other things mentioned in the above point #3. 5. 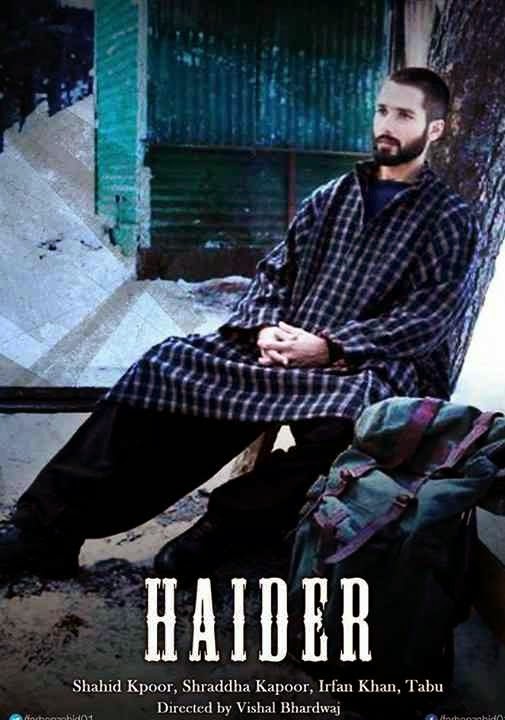 The film portrays Haider's mother and Haider's grandfather as two lone voices of reason who are concerned about young Haider (in a way representing the impressionable Kashmiri youth) coming under the influence of the propaganda of revenge and divisiveness being promoted by the separatists/terrorists. As is often the case, this voice of reason is however a frail one, and unable to prevent Haider's ultimate entrapment into the deadly cycle of revenge. This psychological angle of the story of Haider (and Hamlet) is so believable and relate-able, making it timeless in a way. One wonders why a highly sensitive political context was required to narrate the very human story of Hamlet. Even if one were to argue that nothing happens out of context, and the personal is in a way always political, and also that there is a political context to the original story of Hamlet too (though not as integral part of the story as is the case in Haider), the question remains as to why a certain aspect of the political context is highlighted as a backdrop to stage the very human drama of Hamlet and his inner turmoil. The only possible answer to this can be -- it is the film-maker's choice. Accepted. But as a viewer, I still feel shortchanged at such a response because being aware that Haider is an adaptation of Hamlet, I expect more of Shakespeare in the film and less of Vishal Bhardwaj's politics. 6. The film also raises a larger question: how much politics is acceptable in art? We live in times when politics is all around us. Everyone and anyone who watches news channels or reads a newspaper has an opinion on what is right for the country, what is not good for the country, what should the government do or not do, what is the best way to govern a billion plus people, what is the right strategy to deal with friendly and enemy neighboring countries etc etc.... Can art and artists be any removed from the politics of the day? Difficult to do so, in most cases. Only a few exceptional artists who think of their art as a means for expressing something much deeper than the social-political realities of the day may be able to keep their art untouched by these fleeting occurrences of the present times. For them art remains as an expression of something much beyond, something eternal almost, something that transcends the narrowness of the mental view of complex reality and truth. But for a large number of artists in today's highly politicized reality (an outcome of rational modernity in some ways), art often becomes a means to express their own opinion on the prevalent social and political reality of the day. Nothing wrong with that. And a patron of such art clearly knows that this is the artist's personal statement and decides accordingly whether to endorse it or not. This was not necessarily the case with Haider. Haider is presented as an adaptation of Hamlet, so most viewers familiar with the story of Hamlet are not really prepared for a very sharp political tone of the film. 7. Unlike other artists such as painters, sculptors and musicians, film-makers work with a medium that has a mass appeal and reach. Films are a powerful medium, and films that are based on sensitive and important topics have a potential to generate a wide-reaching interest in the issues being explored. The film-makers therefore have an extra responsibility to be somewhat more balanced and nuanced in their portrayal of the issues, and subtly inform the audience that there may be many more complex sides to the reality which are not being addressed in the particular story portrayed in the film. If a film-maker isn't willing to do that, perhaps he or she may be better off telling stories that are about more universal themes of human experience. But if a specific and highly complex political reality is chosen as the context in which a human story is being played out, as a viewer I find myself wondering whether it is the human story or the context that is ultimately more important for the film-maker. Having said all this, I still think Haider is an excellent film as far as film-making and story-telling are concerned. Do watch it, if you can. Postscript: The views and analyses presented are personal. I am fully aware that many readers may not agree with any or all of what I have written here. I welcome all comments, disagreements and agreements.